Adjustable Box Solar Cooker / Oven. Includes additional cook pot and glassware kit! Save energy and cook with the sun, all year long! SilverFire has evaluated numerous solar ovens and chooses The Adjustable Solar Cooker to offer our customers. 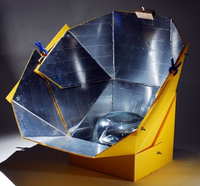 The Adjustable Solar Cooker is inexpensive, easily transported and most importantly it is simple to adjust to maximize solar cooking efficiency. Non adjustable solar products decrease thermal efficiency and cooking duration. The Adjustable Solar Cooker Sunsight (the wooden Sunsight block with shadow peg, viewed on top solar panel edge above), simplifies solar cooker positioning. The adjustable panels insure that you are achieving optimal solar cooking efficiency and maximizing thermal efficiency. Simply stated, the Earth rotates around the Sun and solar cookers require adjustment to maximize thermal cooking energy. The adjustable solar cooker is the most versatile cooker on the market and the best cooker on the market because it does so many wonderful things to keep your food cooking hotter and longer. The Adjustable Solar Cooker is sold with Solar cooker, Trivet and Sun Site $99.95, and the Complete Solar Cooker Kit includes Solar cooker, Trivet, Sun Site, Black Granite Wear Pot with lid, and 2 Pyrex Bowls.The key advantage using the Adjustable Solar Cooker with a pot inside the 2 Pyrex bowls, is you have a smaller heat retention area (inside the pyrex bowls), are all that is required to heat (less surface area to heat.) This is in contrast to non-adjustable solar cookers, that have a single large plastic or glass top that covers the entire solar cooker surface, this requires more energy and longer duration cooking requirement times, due to the greater surface area required to heat. On the summer or winter setting your pot or cake pan stays flat in the bottom of the cooker. It has a summer and winter setting. Just flip it over. It has adjustment bars to catch the sun rise and the sundown. So you can cook from sun up to sun down. In the adjustable solar cooker complete kit you get an additional black pot with lid and two pyrex bowls. These are used to create the Green House effect to help keep the heat in. They also serve as the weight needed to make sure your solar cooker doesn't get blown over in the wind. No staking needed. It is hot and it is hotter longer. You can start cooking at sun up and keep cooking til sun down. 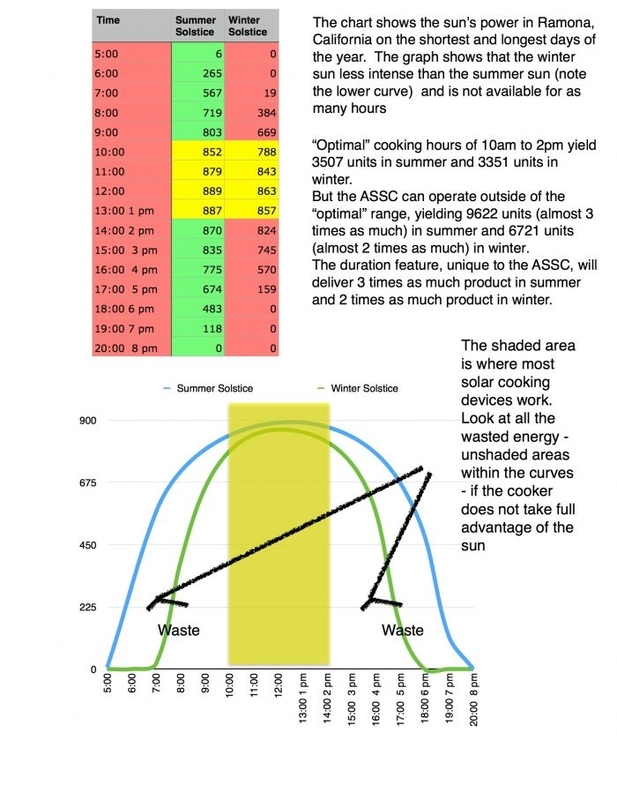 With one adjustment during the day you can cook a pot of beans for over 9 hours of sunlight. Simply put, the Adjustable Solar Cooker will put out more safe water and cooked food than any other cooker in its class. Why? Because the Adjustable Solar Cooker has an adjustable reflector array that allows perfect solar focus from sunup to sundown, with a smaller surface area containing the pot to cook in. This sale is for the $99.95 Solar cooker and includes Solar Oven Cooker, Trivet, Sun Sight, 2 Pyrex Bowls, and Granite Wear Cook Pot ($149.95).